Here comes another one of those gazing into the refrigerator wondering what on earth you can make you make for dinner out of the bits and pieces currently residing in there suppers. And I don’t know about you, but sometimes a few minutes or two meditating into the depths of the fridge produces some of our most creative and scrumptious dinners. 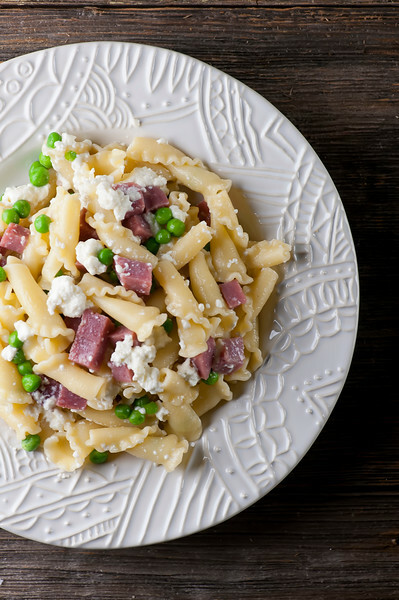 For example, pasta with chunks of salty salami, creamy ricotta and sweet little baby peas. An impromptu match made in heaven! Once again, this starts with a pot of freshly cooked pasta. (So many good things start with those very words, don’t they?) Make sure you save a cup of the pasta water just before you drain it. Side note: pasta water is magical stuff. It’s a little salty, a little starchy, and can loosen up or create or fix so many other-wise too-dry pasta sauces. Anyway, save a little of it, and then toss the cooked and drained pasta back into the pot with a little bit of butter, the peas and the salami. Stir stir stir, dribbling a little pasta water in there to make a teeny tiny light sauce. Now ever so gently, stir in spoonfuls of the ricotta. You don’t want it totally broken up – you want pockets of nice ricotta dollops all throughout. Now ladle it into warmed dishes and serve it up. And remember how just 30 minutes earlier, you were gazing into the refrigerator hopefully. You never know when you’re going to get refrigerator-lucky! Cook pasta according to pasta directions in salted water and drain, saving a cup of the pasta water. Return the hot pasta to the cooking pot. Over very low heat, stir in butter, salami, peas and just enough pasta water to make a light sauce. Stir until everything is combined and warm. Carefully stir in spoonfuls of ricotta, make sure to leave it in little ricotta clumps and not all broken up. Ladle into warmed bowls, grind some pepper on top and serve! 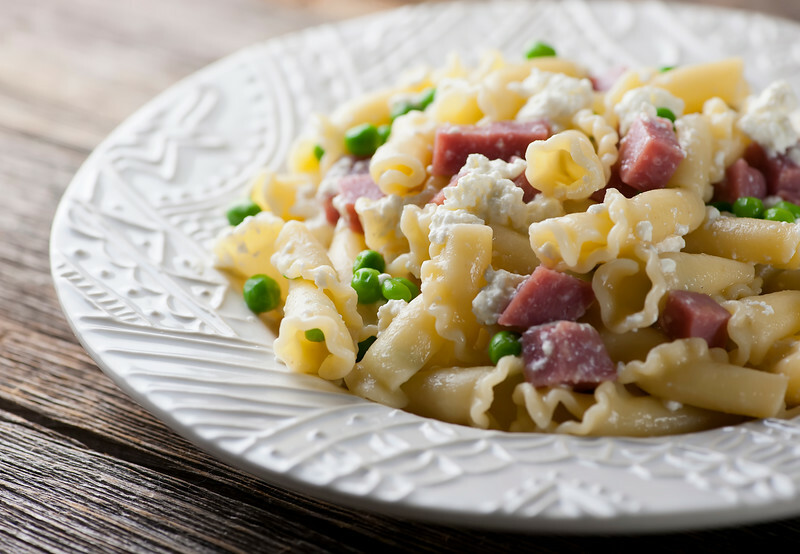 The stir-in ingredients are loose amounts – you can increase the salami, peas and ricotta as much as you like! I bought fresh peas at a local farm market and wasn’t sure what to make. So glad I came across this recipe! Super easy and very delicious. A hit with the whole family! Thank you!